Believe it or not, there is one segment of London’s turbo-charged property market where prices are falling. The thing is, the homes in question are already far out of the reach for most buyers. House prices in the wealthiest parts of London have been falling, with particularly steep drops following the UK’s vote to leave the European Union in June. “Prime” central London prices fell by 1.8% in August from a year earlier, the sharpest decline in almost seven years, according to property agents Knight Frank (pdf). 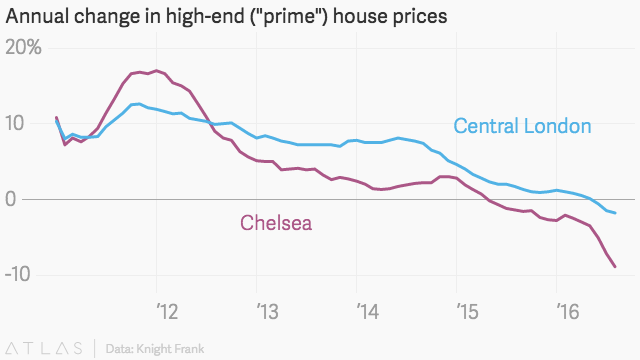 In Chelsea, prices tumbled by nearly 9% in August. Bear in mind, however, that the median price of a home in that posh borough is well over £1 million ($1.3 million). The drop in prices at the high end of the market amid post-Brexit uncertainty is a windfall for a certain type of moneyed house hunter. Foreigners looking for a place in central London benefit from an even bigger discount, given the pound’s decline since the referendum. In the eight weeks after the June vote, viewings increased by 50% for property in the city center compared with a year earlier, according to Knight Frank. Over the next few months, sales in these upmarket areas should pick up, although prices might not, Tom Bill, the realtor’s head of London residential research, wrote in a report. Last month, a report by data provider LonRes (pdf) noted that cost of buying prime property in central London was 18% cheaper in Hong Kong and Singapore dollars than a year earlier, and 5% cheaper in Russian rubles. For locals of more modest means, there is no such luck. The Royal Institution of Chartered Surveyors said yesterday (pdf) that prices in London overall will stay about the same next year, while prices in the rest of the UK drift slightly higher.